ACC Atlantic Division Champions! How sweet those words sound! 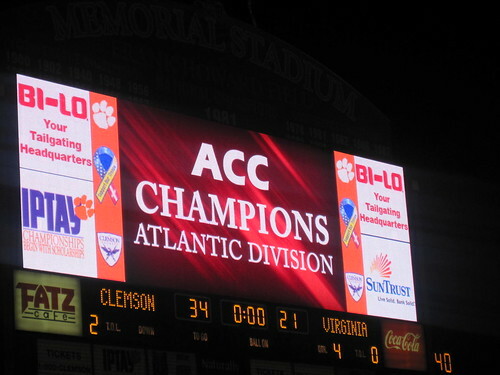 I could not be more proud of Clemson for punching their ticket to Tampa, but before we all get caught up in ACC conference championship game fever we have to win our state championship. It would be so easy for any team to look ahead to the championship game but luckily we are playing our hated rival that is impossible to look past and I really believe that the Clemson players and coaches are 100% focused on this game. Carolina is a very talented football team that desperately needs a win to salvage their season. They have had 2 weeks to prepare for us and I know we will see trick plays. I also fully expect to see their version of the Wild Cat offense at least a few times. They are going to be playing with a ton of emotion in a must win game. They have a very talented quarterback in Stephen Garcia, great receivers in Alshon Jeffrey and Mo Brown in particular, a great kicker, some terrific players on defense especially Stephon Gilmore, Cliff Matthews, and Eric Norwood who I believe is one of the great defenders in recent SEC history, one of the best athletes in the history of USC sports, and is a terrific student-athlete. Luckily we are surrounded by some amazing talent ourselves. We are a team on fire with great senior leadership and coaching that is keeping the team's mind fully focused on this game. Two big things this game will hinge on are kickoff return coverage and the line of scrimmage. I see these two factors as Clemson's biggest advantage in the game. Spurrier has an important decision to make: to kick to Spiller or give Clemson great field position. Carolina’s kick off coverage is ranked 108th in the nation and last in the SEC and has already given up two touchdowns this year. Ford and Spiller make up the most dangerous return tandem in college football and Spiller is one kickoff return td away from the all-time lead in kickoff return touchdowns in the history of college football. Either decision is going to give Clemson a short field to work with. USC is 109th in the nation in sacks allowed giving up over 3.0 sacks per game. Opponents have sacked Garcia 33 times this season while in contrast Clemson has recorded 33 sacks this year. Clemson's defensive sack average is 11th best in the nation. Carolina's offensive line has been a weakness all year, and Clemson's defensive line has been among the best in the nation this year. USC's defensive line has a lot of talent but depth is a major issue. Clemson's offensive line has been playing extremely well during this winning streak. Clemson wins the battle of the trenches flat out. It was a huge reason we won last year and will be a big reason that we win tomorrow. If this game is close towards the middle of the third quarter Clemson should be in great shape. Carolina's depth issues tend to hit towards the end of the 3rd quarter and that is when our lines can really take the game over. There will be many factors in this game. The gamecocks are 17th in the nation and third in the SEC in total defense allowing 308.73 yards per game. This will be one of the best defenses that we have faced this year. Clemson's offense needs to continue to fire on all cylinders. I believe that CJ Spiller is going to have a huge game and I also believe that Clemson will be able to establish the run. USC is 97th in the country and last in the SEC in rushing offense with 116.09 yards per game. If Clemson can keep Carolina from establishing the run and continue to make their offense one-dimensional it is a huge advantage for the Tigers. On paper this game really should not be close. But this is Clemson-Carolina and anything can happen. However the only team that can beat Clemson tomorrow is Clemson. If they are looking ahead to next week or make mistakes especially in regards to turnovers then it is anyone's ball game. Luckily Dabo and the rest of the coaches have this team fully focused and motivated. Clemson is the best team on the field tomorrow and I am looking forward to to watching them prove it! Go Tigers! For a little added motivation Clemson will be debuting new uniforms tomorrow! They are Nike's new pro combat uniforms and they selected 11 elite teams to debut them this year and we will debut ours Saturday. They are pretty incredible--the shoes have tiger paws and the inside collars of the jerseys say all in. And of course they are the tops in performance wear technology. And on a side note, how many Clemson Girls are making it to Tampa—I can not wait to be there!